The Vortex Blue Kitchen/Utility Regular oil boiler has been designed and manufactured by Grant as a floor standing boiler to be installed in a kitchen or utility room. 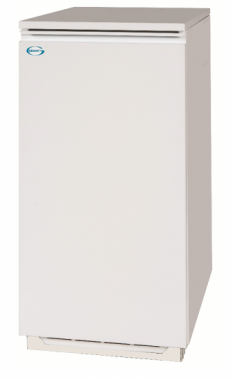 The sleek white casing hides high efficiency condensing technology which delivers a high efficiency rating of 91.7% making it an A rated unit. This model has an output rating of 26-36 kW making the unit perfect for larger homes with 2 or more bathrooms and a higher demand for heating and hot water. This unit features an award winning Vortex condensing heat exchanger, market leading Riello Blue Flame burner and a neon diagnostic indicator. This boiler is extremely quiet in operation. This boiler is also available in outputs ranging from 15-36kW so you can be sure that there will be a boiler in this range to suit your home. It also features a 2 year warranty so you can be sure you're getting a highly reliable unit that won't let you down.